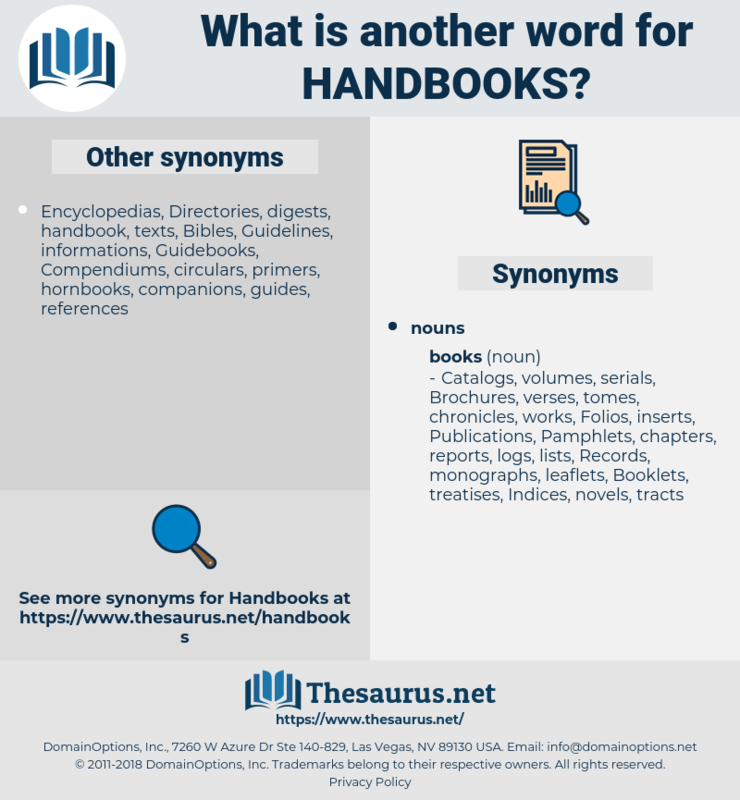 What is another word for handbooks? 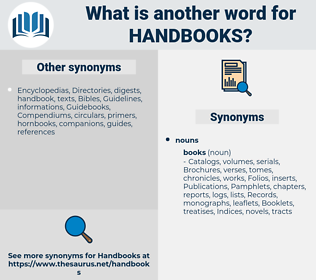 Directories, workbooks, handouts, Brochures, Publications, playbooks, pathfinders, roadmaps, Pamphlets, coaches, Syllabuses, wordings, workings, writings, leaflets, notes, briefs, Keys, ouvrages, kits, digests, sheets, enactments, leaders, Tracks, primers, tools, articles, evidences, constructions, Mentors, rails, issuances, crafts, proofs, flyers, works, traces, packages, clues, texts, structures, materials, Cues, titles, scripts, scouts, Textbooks. Among the poems produced in the first ten years of this century the Original Poems of Jane and Ann Taylor are hardly if at all mentioned in handbooks of English literature; but to thousands of readers they were more familiar than the contemporary verse of Wordsworth or Coleridge or even of Scott. Certain handbooks and exposure meters will be of service while you are learning the classifications of subjects.